Here's another example of a straight up anthem of mine. It's just indie enough for me to have a strange personal love affair with it. Something so incredibly 'home-spun' about it yet funky as all hell. One song that I sing along with word for word. And, one you can always see me air-keyboarding the funky synthesizer riff to. The deep funk bass line and tight drum machine make it probably the earliest possible appearance of true g-funk sound. Not to mention the vocals sound like the blueprint for Nate Dogg's entire style. It'd be a kick, and totally make sense if this was his relative. From the beginning slow backwards slap of the snare right into heavy funk, it's a serious bomb track. Part of it's appeal is Kevin's total lack of excitement. His lackadaisical approach sets the tone for this ridin' anthem. He's slow and steady and it's a 'ha-ha I told you so...good ridance' kind of vengeful break up song. He simply asks... after you leave, close the door. But, the little bit of melodic scatting he does at the end is priceless. 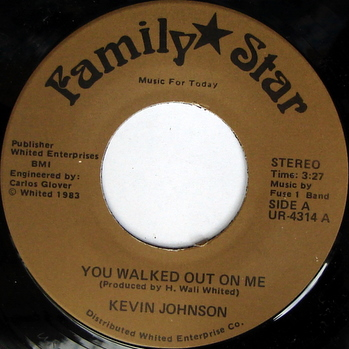 Quality modern soul funk 45 by Kevin Johnson who perhaps never got to record any more. A song that makes you wanna bump it driving in your car, in the summer, with the windows down. I struggled with this one quite a bit. It wasn't cheap. But, it just was one of those that wasn't turning up for me EVER. So, I had to take the plunge. Couldn't wait to have it any longer. More hard earned dollars going straight to Mr. Craig Moerer. But, I simply just had to have this. Now, you can benefit from my purchasing power with this limited mp3. Wow, I'm watching too much late night TV while writing these posts. That's funny, to me Kevin Johnson has always been a basket ball player of the Phoenix Suns! Thanx a lot for all these post, I'm just discovering the blog, you do it great. good job on your review, i also have this one ill do a review of my own eventually. stop by my blog, freshly made but ill post more reviews soon. More Kevin Johnson on Itunes.